2nd form students visit churches on Hope Road Vicinity. Ask form teachers to dedicate one form session to the young men sharing what their acts of kindness were and their resolution afterwards and why. Begin with a centering activity. The aim of the task is to help students get in touch with their/your true self; your spiritual self. 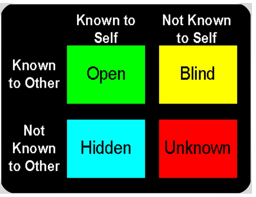 The bottom right hand quadrant is unknown by self and unknown by others (red). It is that area known by God that we need to discover through settings like these, along with the hidden and blind areas that come through interaction with others. This leads us to our theme today, which calls for a living out of spiritual values in order to have a purposeful life, one that is filled with integrity because our private life meets our public life. The Speaker presents for 15 minutes on the theme: “I’m a God-guided youth: Living bold and strong”. The Panel discussion follows and then a 30 minutes period of question and answers facilitated by a panel of 3 persons.